Style: Barrel aged (3 months in ex-Old Scout bourbon barrels) dry gin. Appearance: Very pale gold, like a young white wine. Nose: Juniper, cedar, bitter lemon, sweet cinnamon, wet earth. Palate: Full bodied and medium dry. Candy orange slices, five spice powder, mace. Mixed: Did well in literally everything I put it into. Great in the cocktails in which barrel aged gin usually excels like perfect martinis, negronis and Princetons. Surprisingly, it’s every bit as good with tonic, juice and in a dry martini. Did very well in a McClary Bros. Ginger & Lemon shrub. Parting words: Smooth Ambler is best known for their wonderful and popular Old Scout line of MGP-sourced bourbon and rye. They’re not just independent bottlers, though. They also distill spirits themselves. One of those spirits is their well-made Greenbriar Gin. It’s a juniper-heavy, but still full bodied gin good for just about anything. Unlike many gin producers, they use a mixed grain recipe that is similar but not identical to the mashbill used for their Yearling wheated bourbon. That gives it complexity and heft that many craft gins lack. That heft serves it well when they put it into barrels. The result is a gin with the bitterness and spice one expects from a barrel aged, but with an added edge that allows it to work just as well with tonic and dry vermouth as it does with sweet vermouth and amaro. This is a one-stop gin. No need to keep a bottle of Seagram’s in the fridge for G & T’s when you have this gin on your bar. That versatility goes a long way towards making it worth a purchase even at $41. It’s like that friend you have who is just as much fun to be around at a rock concert as she is at a house party or an art museum. Smooth Ambler Barrel Aged Gin can go anywhere with flavor. Highly recommended. Nose: Lime zest, orange peel, juniper, earthy red wine. Palate: Full bodied and semi-dry. Hot. Like eating lemonheads under a pine tree. Finish: Raw ginger, fresh cut pine. Mixed: Surprisingly good in Tom Collins and with tonic. Adds a pleasant gingery bite. Does as well as expected in a Negroni, Princeton, Aviation, Bronx and a perfect martini. Much better than expected in a dry martini. This gin was great every way I tried mixing it. Parting words: I’ve had this gin in my liquor cabinet for quite some time now. I didn’t drink it much because I view barrel rested gins as good for Negronis, perfect martinis and not much else. I was wrong in this case. Liberator barrel rested gin is good for anything you want to do with it. Like its unrested sibling, Valentine’s rested Old Tom gin is aggressive but still elegantly blanced. It’s like a tall, attractive exchange student who grinds on you at your senior prom. Yes, it may cost you a lot of money, but it’s well worth the experience. Liberator Barrel Rested Old Tom Gin is highly recommended. Style: Wildflower mead aged in rye whiskey barrels for one year. Appearance: pale gold with big thick legs. Nose: Brown butter, oak, overdone fruitcake, dandelion stems. On the palate: Sweet and full bodied. Honey, citrus, cut clover, old oak, woodruff. Finish: Sweet and viscous. Some acrid oak and orange peel. Then fades slowly. Parting words: This is a good one. It’s much more drinkable than the first bourbon barrel finished mead they did. The bitter edges of the mead are taken off by the barrel aging and probably my cellaring for even longer. I still have one bottle held back in reserve. It’s a cliché, but this mead is dangerous for the pocketbook and the brain. It tastes like a before dinner drink but it’s at an after dinner ABV. The price is steep but it’s a one-off and delicious. 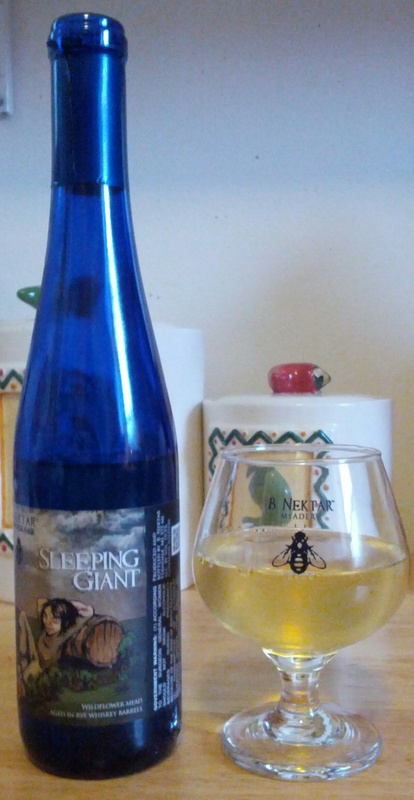 Sleeping Giant is going to be really hard to find at this point, but consider my recommendation as an endorsement of all B. Nektar barrel aged meads. Sleeping Giant is highly recommended. Nose: lemon peel, Clementine, angelica, cinnamon, ginger, tobacco. On the palate: Full bodied and spicy. Black pepper, cardamom, cassia, alcohol. A splash of water brings out more sweetness and a lot more cinnamon. Finish: Cinnamon disk and alcohol burn. Fades very slowly. Mixed: Does surprisingly well in cocktails that are traditionally better suited to unaged gin. Makes a spicy dry martini and a respectable gin and tonic. It is really fantastic in a perfect martini (half dry and half sweet vermouth) and adds a great spicy aspect to a negroni. Parting words: Like its unaged sibling, this gin is a wild ride. When I tasted it neat (how Rifino Valentine says he drinks it) it changed in the glass substantially from first sip to last. At first it was all citrus. Then it shifted to more traditional Old Tom Gin flavors, then it became a cinnamon bomb. As noted above it is available only at the distillery in Ferndale, for a bit more than the standard version. It’s over the top, but it’s delicious. Barrel-aged Liberator is highly recommended. Finish: Tangy apple, carrot cake with vanilla icing. Parting words: This stuff is so sweet that I ran out of desserty descriptors when I was writing this review. I don’t know where they got the barrel this was aged in, but it imparted a crazy amount of vanilla and caramel to the cider. I assume it all comes from the barrel. I would be disappointed if some vanilla or caramel flavoring was added to “round out” the barrel flavors. Speculation aside, Woodchuck Barrel Select earns a recommendation.